You know how, when you are completing mind-numbing tasks, you enter into your own mindspace and muse over all sorts of random things? Well, I was happily doing that this morning, in the fresh hours between 7 and 8, as I broomed our outdoor courtyard after finishing off weeding it yesterday. Suddenly, a niggle gnawed at the corners of my consciousness. It wouldn't go away and made day-dreaming very challenging! Then I could bear it no longer and decided to pay the troublesome twinge some attention. What I discovered amazed me! Here I was obligingly, and even a little grudgingly, sweeping the courtyard, thinking I was 'just completing the job' and being thorough, when actually I was 'engaging my core'! You know, that catch phrase that is everywhere in exercise circles at the moment? That you can't be working out properly and efficiently unless you are 'firing your centre', 'engaging your core', or 'working those abs!' Well, grab a broom and you can do it, whilst getting some work done, and for free! 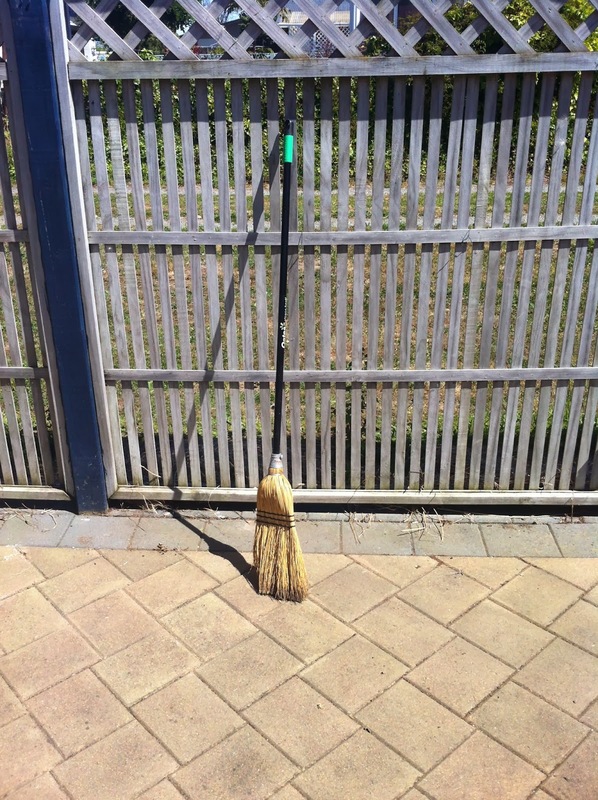 I wasn't using your run-of-the-mill broom with the flat horizontal bristle-head, but one of those old-fashioned, long bristled, elongated D-shaped brooms (the ones like witches fly on in cartoons). With it you have to stand kinda sideways and sweep from behind you and to the front- it really gets your tummy and back and side muscles going!! So then, I started a whole new daydreaming saga of freeing the masses of gym-bound mums into a life where they got the bods they wanted (and their domestic and yard-help probably had), and got hospitable houses, gracious gardens, and appreciative families too! All for free! Just by working harder, smarter, and probably how our grannies did.